No End to Lesotho's Instability? 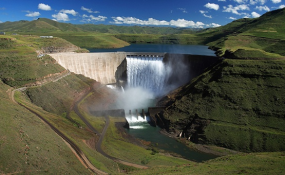 The Lesotho Highlands Water Project enables Lesotho to sell water to South Africa, but new construction in the country has been retarded this year, says the IMF. Cape Town — Three top Basotho military and police commanders implicated in recent political turmoil in the country will step aside to help create a climate in which new elections can be held. This was announced by South African Deputy President Cyril Ramaphosa in a broadcast from Maseru on Thursday night, Lesotho time. Ramaphosa, who was the principal African National Congress negotiator during South Africa's transition to democracy, is the leader of a regional team from the Southern African Development Community (SADC) which is facilitating a settlement of Lesotho's political and security crisis. He said Lieutenant General Tlali Kamoli, the country's former military commander - who was fired by Prime Minister Tom Thabane but refused to step down, the new commander, Lieutenant General Maaparankoe Mahao, and the Lesotho police commissioner, Khothatso Tsooana, will all take a "leave of absence" beginning between 14 and 21 days from now. "They have also agreed," Ramaphosa said, "to do everything in their power to actively prevent, discourage and ensure that no further confrontations or hostilities are caused or occur between the members and the units of the Lesotho Defence Force and the Lesotho Mounted Police Service." In their absence, their deputies will run the army and the police. Lesotho's recent history has been plagued by partisanship on the part of its security forces. At the end of August, after a months-long stand-off between the two main parties in the country's coalition government, Prime Minister Thabane dismissed Kamoli. In action which Kamoli is suspected to have directed, troops left their barracks and took over police installations, sending Thabane fleeing to neighbouring South Africa. A policeman died in clashes between soldiers and police. SADC regional leaders brokered Thabane's return, and then agreement to reconvene Parliament and bring forward elections from 2017 to February 2015. But the failure to bring the security services under uncontested control by the government has constituted a major obstacle to efforts to create a climate for peaceful elections. Ramaphosa said the agreement of the commanders to step aside was a "major milestone" in efforts to stabilise security ahead of the elections. He also said the country needed "long-term security reforms" and that during their leave of absence the commanders would make "working visits" to SADC, Commonwealth and African Union countries. The commanders publicly signed the agreement, entitled the "Maseru Security Accord", during the live broadcast of the event during which Ramaphosa announced it.